Alter The Press! : ATP! Album Review: Aficionado - Empty 7"
ATP! 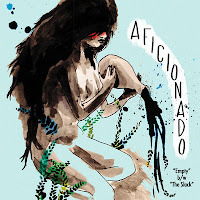 Album Review: Aficionado - Empty 7"
If Aficionado don’t release their next full-length soon, we’re gonna lose it. The seven-member group has sculpted one of the biggest teases of the year with their 7” "Empty" - the creatively two-faced result of a band finally refusing to let their orchestraic setup muddle and overwhelm their sound. 'The Slack' brings us in with Laura Carrozza taking lead on vocals, an emulation of Metric’s Emily Haines hovering over a pulpy guitar that eventually strains itself out into a simplistic, videogame riff and ripping the track away from a foggy melancholy. Next, singer Nicholas Warhol returns with his ‘90s sweetheart pipes on title track 'Empty' - stepping away from indie and into some traveler’s rock. Though it isn’t but a few seconds in that Aficionado make their signature nods at mixing tone colors; on full display with Carrozza’s flute solo taken aback by distant screams and all falling through with touches of classic stadium rock. The lyrics could use a bit of work (“I can’t get full ‘cause I’m empty” isn’t the best display of their creative license), but such a polarized relationship between two songs successfully shows Aficionado are more than just a large group with a flute thrown in for kicks. If "Empty" is any sense of a preview for a potential upcoming full length, then this record makes you want to see how the band can fill in that gap they’ve created between these two sounds. Or, better yet, to see what other gaps they can create. "Empty" will be released on September 25th through No Sleep Records.